"GREAT FALLS" An original oil painting on a 12 x 24 inch hardboard panel. The original painting is available through my studio. Contact me. This oil painting was challenging to create the atmosphere, ... the transparent mist that filled the canyon. I'm just in awe when I see any waterfall that has a large volume of water going over it. The Power! Rock breaking! I love waterfalls and I miss the small but beautiful eight foot cascade in my back yard on the river where I lived in Vermont for twenty four years. Just around the river bend was an 18 foot waterfall... not big, but beautiful and a great place to cool off under in the summer! 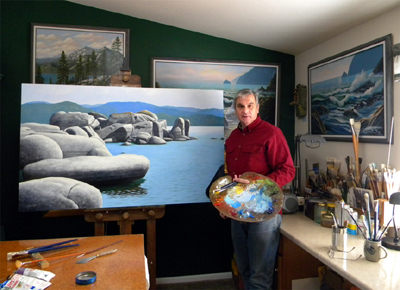 Great Falls was created by artist Frank S. Wilson in 2014. This art piece , which is part of the Landscape Oil Paintings portfolio, is a Paintings artwork. The style of this artwork is best described as Realism. The genre portrayed in this piece of art is Landscape. The artwork was created in Oil, Painting. The size of the original art is 24 (inches) H x 12 (inches) W.
Words which artist Frank S. Wilson feels best describe this work of art are: great falls, waterfalls, waterfall, realism, river, wilderness, rocks, california, sierra nevada, mountains tree, trees, frank wilson, waterfalls, great waterfalls, large waterfalls, cliffs, river, rivers, yosemite, yosemitewaterfalls, great waterfalls, .